My Sinful Chocolate Affair with ROYCE’! ROYCE’, dubbed the ‘Rolls Royce of Chocolate’, is proud to present the ROYCE’ Chocolate Workshop Series in collaboration with B.I.G, CultureRun and Chef In a Hat! The workshops are held at B.I.G’s Masak-Masak corner at Publika. It all started in 1983 in Hokkaido, Japan. The premium chocolate company became synonymous with its exclusive and decadent chocolates and finally made its way to Malaysia in 2005. There are currently eight locations to purchase ROYCE’ all over in KL and PJ. 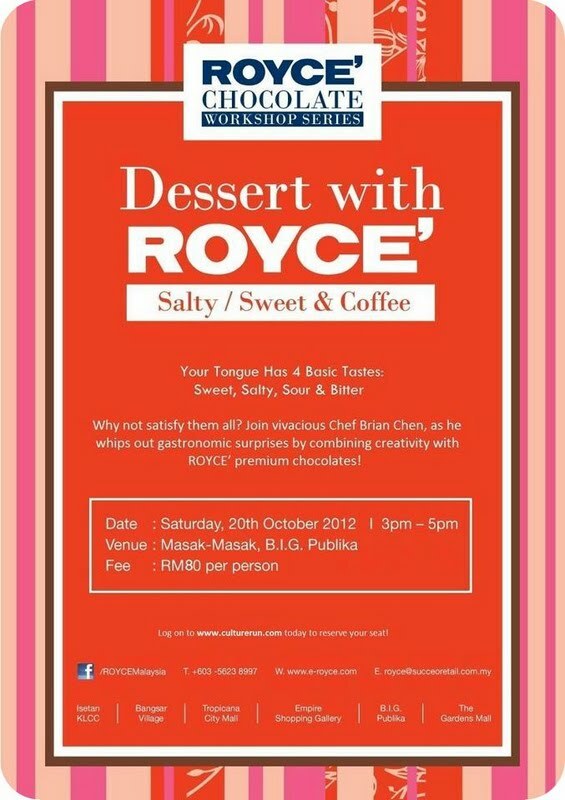 The workshop is a creative inspiration featuring desserts inspired by ROYCE’ chocolate products. 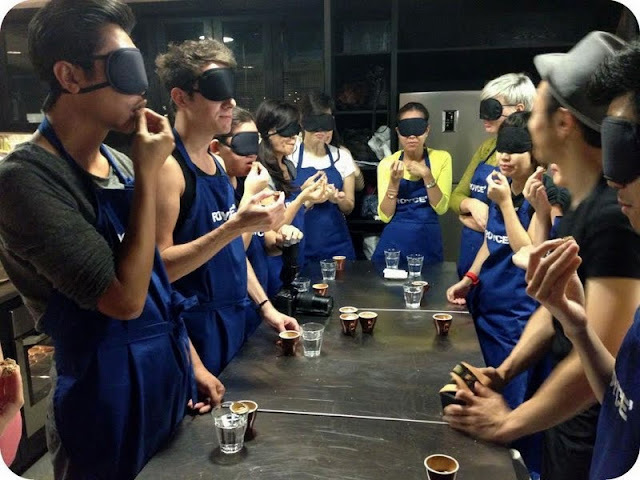 I attend last week’s workshop themed Desserts with ROYCE’ Fruity and Nutty together with 11 other chocolate enthusiasts! The Chef in a Hat stole the show! Chef in a Hat, Brian Chen was absolutely humorous and witty, making everyone feel right at home from the beginning. We were tasked to make two desserts, Chocolate Layer Cake with Strawberry Mousse and Nutty Chocolate Ganache Mini-Torte. Before beginning, we had a good session of ice-breaker and got to know some of the participants a bit. After that, we were quickly sectioned to a group of three before proceeding with the workshop. Check out the Nutty Chocolate Torte recipe at the end of the post. We had fun, of course! My team consists of Bianca, Su Yen and myself. Seen here is Bianca having a whipping time of her life with whip cream! This is Daniel, an auditor who is single but not available (wink! ), seriously whipping up his cream. Our first dessert, the Strawberry Mousse or actually we picked Blueberry instead! Once done, we chilled it and moved on to our next dessert. The next dessert was a Breeze! Chop up some dark chocolates, add in sugar & butter. Heat this up over a bain-marie, double boiled method, till everything is melted and combined. Checking for consistency of the chocolate batter. Mix in the dry ingredients, fold and voila! The chocolate torte is ready for the oven. The best part of the workshop!! While our torte was baking and the mousse was chilling, we get to sample coffee or tea by Plan B. and chocolates by ROYCE’. I simply cannot decide on a favorite because each one was really awesome in its own distinctive flavors and textures. We cut out our chocolate layer cake and fill up our piping bags with our chilled mousse all ready to pipe. Here’s the fun part… creativity at it’s best! Of course we cannot resist sampling! In between decorating, we had to make sure the dessert was good… wink!! Voila… my Chocolate Layer Cake with Blueberry Mousse! Next, we made a dark and rich chocolate ganache and crushed some nuts! Drizzled the ganache over the torte that was still warm! Then Brian showed us another way to glam up our torte by removing the liner and turning it upside down before drizzling sinful ganache over it while finishing up with some crushed nuts. Prize giving… for the two teams that executed the desserts! We sure had FUN… making desserts, tasting ROYCE’ chocolates and meeting new friends! 2. Start with the cake by melting the dark chocolate, butter and sugar over a bain-marie (double boiler method). Once all melted into a smooth consistency, remove and let it cool a bit. 3. Still a little warm, add in the eggs one by one and stir gently till combine. 4. In another bowl, mix together the ground almonds, breadcrumbs and vanilla. Add in the melted chocolate and egg mixture and combine well. 5. Pour the cake into the paper cups and bake for 35-55 minutes. Certain oven may vary for cooking time so check the cake after 30 minutes. Remove from oven and allow to cool. 6. For the Chocolate ganache, break up the chocolate and place into a large bowl. 7. In a separate pan, bring the double cream and icing sugar to the boil and then pour it over the chocolate. Stir until the chocolate melts and the mixture is smooth. Set aside to cool a little. 8. Gently remove the torte from the paper cup, turn it upside down and trim the base to make it flat. Spread the ganache over the cooled chocolate tortes using a hot palette knife to ensure it is distributed evenly. 9. Garnish beautifully with crushed toasted almonds. Serve and enjoy! Last but not least, I couldn’t resist purchasing a box of Champagne Pierre Mignon Nama Chocolate for some indulgence! It's packed with a cooler bag and even comes with a ribbon upon request. Sugar overload...but I like! Irresistable! Slurpsss!!!! <3 this post! Tried their Dark Chocolate before, indeed something unusual.... xD So happy to see all of you having fun there! Such a mirthful event! I saw your photo on BIG FB page.. looks FUN.